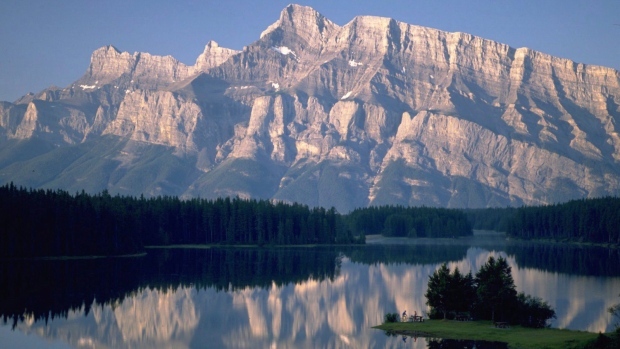 An Alberta company is exporting some of the province's fresh mountain air, by compressing it in canisters and selling it online. Vitality Air sells canisters of air and oxygen, collected from the Rockies in Banff and Lake Louise, company co-founder Troy Paquette said. Paquette told CTVNews.ca that the idea to sell mountain air started as a bit of a gag, after he and company co-founder, Moses Lam, spoke with some friends who had recently returned from Asia. The friends mentioned how bad the air quality was overseas, and "how lucky" Albertans are to enjoy good air quality on a daily basis, he said. The price for a Vitality Air canister of air ranges from $16 to $35. The price for a canister of oxygen starts at $27.99. According to the company website, all of the canisters are free of CFC's and other propellants, and are 100 per cent recyclable. Paquette notes that there is a difference between the canisters of air and oxygen. The air, which is collected from the sites and put into canisters, is mainly intended to be a novelty gift or souvenir and is no different than what you breathe when you visit Banff or Lake Louise, he said. The oxygen canisters, on the other hand, contain about 95 per cent oxygen and are intended to be used recreationally, similar to how people may visit an oxygen bar, he added. Popularized in the 1990s, oxygen bars are establishments that sell oxygen for recreational use to enhance wellness. At a typical bar, customers pay to inhale oxygen through masks or plastic tubing, and the bar may offer scented oxygen. Proponents of oxygen bars claim that the practice can help reduce stress and increase energy. "What we do is offer it in a can, so people can use it on the go," Paquette said, stressing that the oxygen is not intended to be used as a medical device. "Basically, you spray it in your mouth and inhale it." On the company website, the oxygen canisters are advertised as a way to help users recover from a hangover, enhance their athletic performance and prevent altitude sickness. While the company has only been selling the canisters for about eight months, Paquette says the response from customers has been positive. He said many of the customers in Canada are buying the canisters as novelty gifts. However, international customers are buying them to give themselves some "relief" from the heavily polluted air where they reside, he said. "Overseas, what we're finding is that people are using it just for relief," he said, noting that orders have come in from China, India and Iran. "One guy said that the air in Beijing right now is 'almost chunky,' so to be able to have a cool, breath of fresh air – for them it's a relief." He said the company has started to receive distribution requests from China, as the air pollution levels in the country’s capital reaches record levels.